At 2.30pm today 10 people arrived unannounced at the offices of Cairn Energy at the Clydesdale Plaza in central Edinburgh. 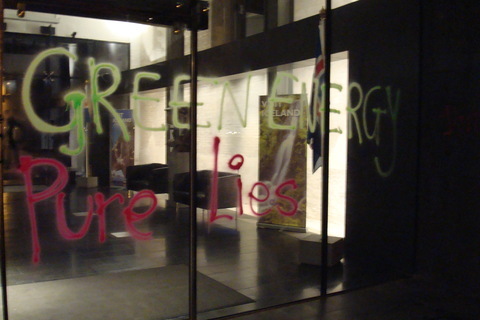 They installed themselves at the grand entrance to the building, blowing whistles and shouting: “No oil for Vedanta! Stop, stop, stop the deal!” and “Vedanta out of Sri Lanka”, attracting the attention of the floods of passers-by attending the Edinburgh theatre festival. Three of the demonstrators gave out leaflets in the street from the campaign group Foil Vedanta and explained that the demonstration was timed with Cairn India’s AGM in Mumbai, where the Vedanta-Cairn deal would be discussed. The leaflets describe the protest as in solidarity with Indian people’s movements in communities affected by Vedanta’s atrocities including Niyamgiri and Puri in Orissa, Advalpal in Goa, and Thoothkudi in Tamil Nadu. They stress Vedanta’s poor environmental track record and demand that the company should not be allowed to take over Cairn India, an oil company drilling in pristine ocean off Sri Lanka. Protesters claim this is a British issue as both Cairn and Vedanta are British companies, and have been aided by David Cameron and the British Ambassador to India in pushing the deal through. The leaflets highlight Vedanta CEO Anil Agarwal’s position as the 17th richest man in Britain and claim the British government has allowed him to evade millions of pounds worth of tax using Jersey and Bahamas based tax havens. One of the placards showed Cairn CEO Bill Gammell and Vedanta CEO Anil Agarwal in bed with David Cameron and read ‘Bill Gammell, Anil Agarwal, David Cameron in bed for oil’ while another slogan accused all three of having ‘blood on their hands’. A stack of leaflets was handed in to the building to distribute to Cairn Energy staff and a security guard warned those gathered that the police would be called if they remained at the building. This warning was taken seriously in the light of Cairn Energy’s zero tolerance policy on protests at the same offices by Greenpeace a month earlier, at which the company took out injunctions against Greenpeace preventing them from publishing any pictures of the event. The protesters left after an hour. 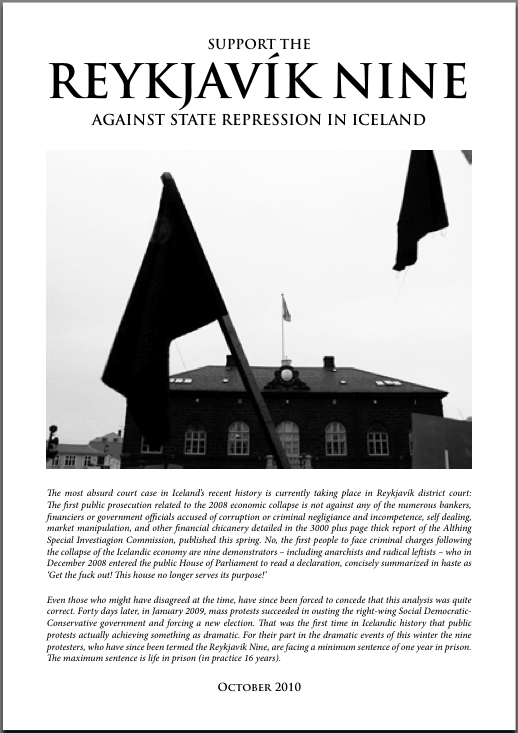 An international week of actions has been called for 10th – 16th of January, 2011 in support of the Reykjavik Nine, nine individuals including anarchists and radical leftists, who face up to 16 years in prison for protest against the Icelandic parliament. In December 2008 the bullet that killed Alexandros Grigoropoulos set fire to the streets of Athens, a fire that soon spread to every city across Greece. That same December on the opposite shore of Europe, in Iceland another revolt was already under way born out of the wreckage of the economy that had collapsed that fall. 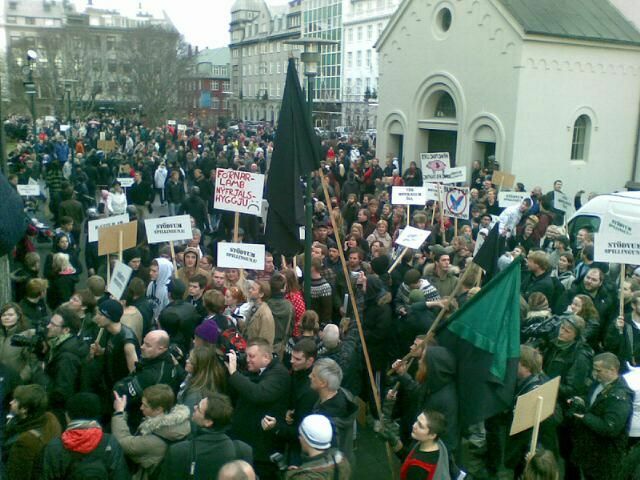 In the winter of 2008, Iceland, the first ‘victim’ of this global crisis, was witness to the largest mobilization in its history. Demonstrations, mass gatherings and popular assemblies, direct action and confrontation on a daily basis and finally mass riots managed to bring down the right wing government at the time. But, just like in Greece that bullet was only one cause to a revolt that had a thousand reasons behind it, in Iceland the bubble that burst that fall was only the spark for the pent up rage and frustration resulting from two decades of neoliberal government – and well, against the political and economic system in its entirety. 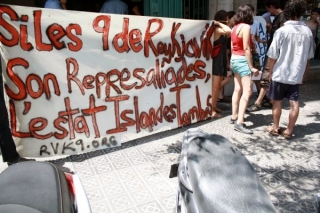 Supporters of the Reykjavík Nine have prepared a brochure in solidarity and support of the RVK-9, as the nine are often referred to. The nine currently stand trial, accused of having attacked the parliament of Iceland on the 8th of December 2008 and threatened the independence of the parliament. Read more about the case and the context around it in the brochure, which can be downloaded in PDF format here, or by clicking on the picture above. Please mail, print and distribute as widely as possible. Click here to visit the support site for the Reykjavík Nine. Early in the morning of Wednesday the 16th of december the Icelandic embassy in Copenhagen was attacked. 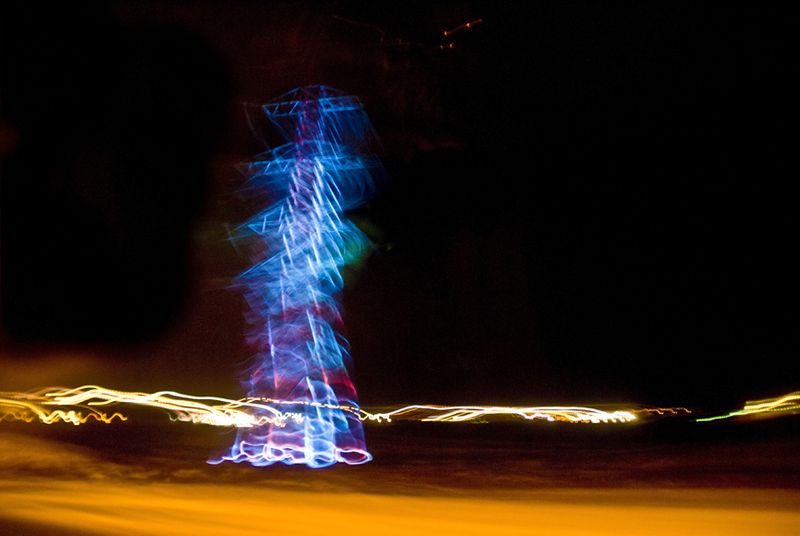 A security camera was disabled with spray paint, the Icelandic coat of arms was defaced in the same way, green paint was splashed on the front of the house and on the front door, in large letters, “Green energy – pure lies” and “Nature Killers” was sprayed amongst other thing’s. The Icelandic government boasts of it’s prowess in the production of “green” energy but there is no such thing as green energy, especially if it is then used for heavy industry. 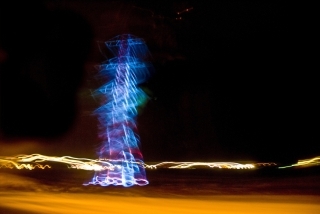 “Green” energy production is just as destructive to our environment as other energy production, the effects are just better hidden. The earth’s ecosystems are suffering because of mankinds actions, this must end. 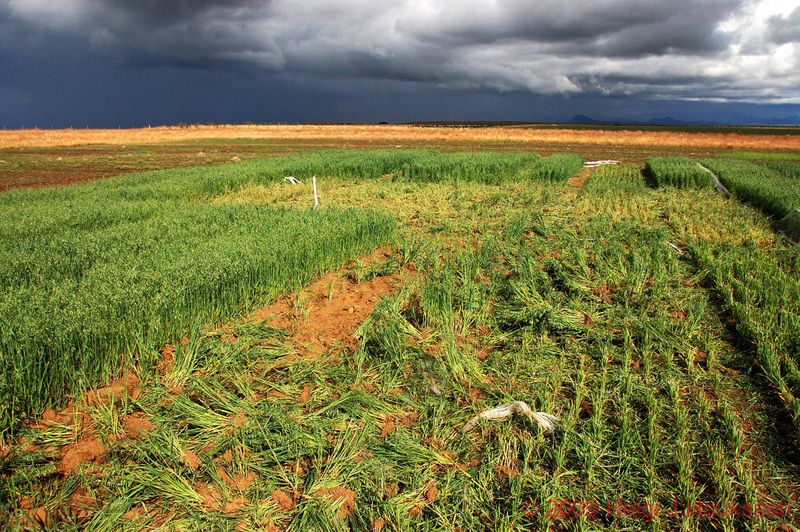 On Tuesday night or yesterday morning, a serious sabotage was done on a GMO testing field in Iceland. The field is owned by ORF Líftækni, a company that was experimenting with growing genetically modified barley for use in medical researches, the skin product industry and medicine development. According to the company’s CEO, Björn Lárus Örvar, all the barley was trashed, which means that the company will not get any harvest this coming fall. The financial loss runs on millions of Icelandic Krónur (ISK). 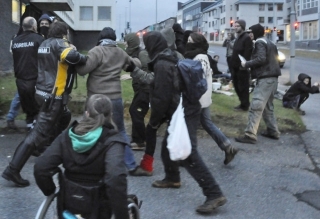 This morning, 20 people from Saving Iceland stopped work on the Norðuál/Century’s smelter construction site in Helguvík. People locked on to three vehicle gates in to the site and therefor stopped all traffic in and out of it. 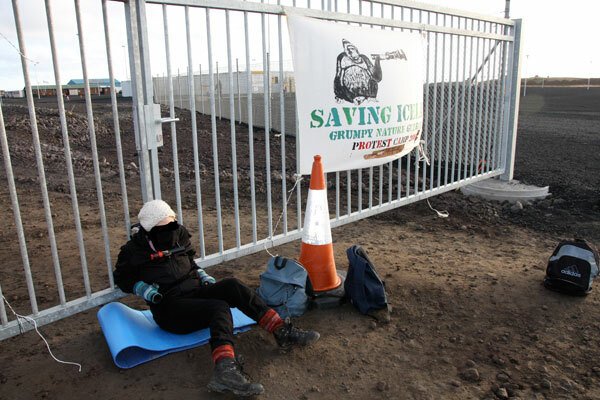 People also locked on to machinery on the site so the work was stopped for at least two hours. The construction in Helguvík has to be stopped to prevent further destruction of wilderness by the damming of glacial rivers and geothermal areas, as well as the global impacts of aluminium production. UPDATE: 04:30 – Everybody has been released. After a brutal arrest of 5 people during a Saving Iceland protest today (read about it with clicking here), around thirty people gathered by the police station in Reykjavík to protest against the arrest of their comrades and the police violence. During the noise demonstration, two more people were arrested after trying to blockade the fence of the parking lot by the station. According to witnesses, one of them was seriously injured by the police who beat him to blood. We have received no proper photos yet, but hope to be able to put them on the website as soon as possible, as well as more information.